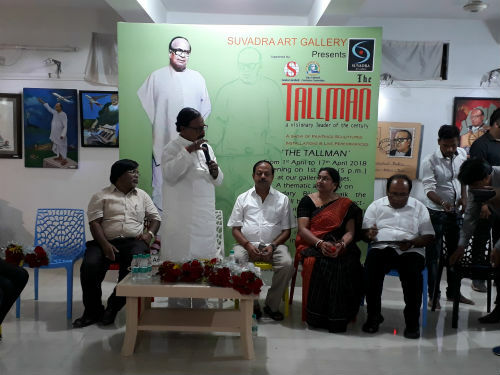 Bhubaneswar: Curtains came down on the 15-day exhibition of paintings, sculptures and installations on legendary leader and former chief minister Biju Patnaik titled “The Tallman: a visionary leader of the century” at Suvadra Art Gallery on Sunday. Finance and Excise Minister Shashi Bhusan Behera was the chief guest on the concluding day of the event to pay tribute to son of the soil and architect of modern Odisha Biju Patnaik. Former Minister and MLA Debi Prasad Mishra was the chief speaker on the occasion. Mishra is also the convenor of Biju Patnaik Birth Centenary Committee. Other guests included MLA Pranab Balabantaray, Director of Culture Bijaya Kumar Nayak, Deputy Director of Culture, Chhattisgarh Government Purnashree Raut, Managing Director of NGO Sambandh Bibhukalyan Das, Assistant Commissioner of Income Tax BK Mohanty and Editor of Dhwaja Priyaranjan Sahu. “The concept of thematic art expo in Odisha is at a stage of infancy. 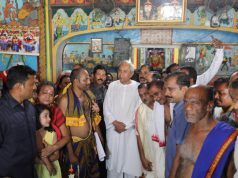 I had never imagined that the art expo on Biju Babu ‘Tallman- A visionary leader of the century’ will receive such positive response from the art enthusiasts from across the nation. 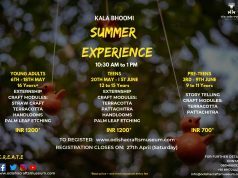 This was just the 2nd thematic art expo and we are planning to introduce more such exhibitions. The next thematic art expo will explore Bhubaneswar as a city of art, culture, modern infrastructure, technology et al”, said Suvadra Art Gallery chairperson Surya Rath. The art expo on its concluding day witnessed a live clay modelling art of eminent artist Rabi Narayan Rath who is famed for completing his creations in just under 10 minutes. As many as 32 artists out of 53, who had participated in the expo, were felicitated during the ceremony for exceptional contribution to the theme. 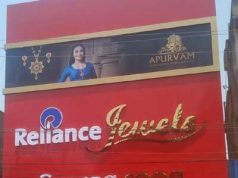 “Artists from different quarters of the country have been greatly inspired by Biju Babu and the artworks they presented in this expo took everyone by surprise. Such thematic exhibitions will surely inspire many to not just follow his footsteps but also contribute towards building a progressive society”, said gallery director Ashok Nayak.